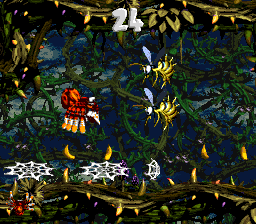 Web Woods is the twenty-seventh level of Donkey Kong Country 2: Diddy's Kong Quest. It is the fifth area of Gloomy Gulch, and is set in a fog-infested forest. Although there is a layer of fog covering the screen, this is not the primary feature. Instead, Diddy and Dixie Kong are transformed into Squitter from a small room after the first portion. With the exception of the End of Level Target, the stage portion is the only instance in which the player plays as the Kongs, from a two-floored terrain with numerous Krunchas, Kutlasses, and Neeks. 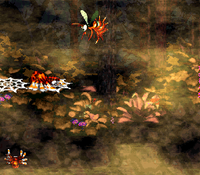 A variety of aerial and land enemies are featured in Web Woods. For most of the level, Squitter must cross over huge pitfalls, which he can only do by creating temporary web platforms. A lot of Zingers and Mini-Neckys appear in the large gaps, but the ground portions usually have Kaboings. Squitter can attack most of the enemies by firing web projectiles at them. In some parts, Squitter must shoot his web platforms upward to pass above the elevated pillars. Diddy stands on the edge of a ledge. The level begins next to a few stair-like platforms that have Neeks on them. A DK Barrel is at the top of the stairs near a high piece of land. The Kongs can climb up to the piece of land to find a crate and a treasure chest containing an item. They also find a pair of Krunchas and a Kutlass here. Some raised land appears behind the area with the Kutlass, holding a Banana Coin. The letter K sits in front of it. If the Kongs do not choose to climb up to the raised area found after the DK Barrel, they can continue along the path to find two Kutlasses. After climbing up some platforms from here, the Kongs head along a pathway to a Neek. A lower area with a hill to the right of it is ahead. The Kongs must move around the hill by traveling along the path to the left, which leads them slightly closer to the foreground. A small ledge is shortly after this path that drops the heroes to another pathway with several Neeks on it. The path leads around the hill to a slightly raised piece of land with a Zinger on it. A Kaboom in a TNT Barrel rests next to the Zinger. Squitter crosses a gap on web platforms. If the Kongs pass the Zinger, they can find a passage in the side of a wall that takes them into an area with an Animal Barrel in it, which transforms them into Squitter. A DK Barrel floats above the Animal Barrel. At this point, Squitter must enter another passage in the side of a wall. The passage takes him into an open area. A gap can be found at the beginning the area, with a Zinger and a Banana Bunch floating in it. Farther ahead, some raised land with a Zinger on it can be seen. A Kutlass waits for Squitter at the bottom of the hill. Using his webs to climb the hill allows Squitter to reach a pathway with several stairs on it. Kaboings bounce all the way up the stairs. An abyss can be found to the right of here with a few Zingers flying throughout it. Two Zingers guard a DK Barrel at the top of a hill that follows this gap, and a smaller abyss can be found after the hill. A Kloak stands on a platform on the other side of the gap. Another gap follows the platform, along with another platform on the other side. There is an vertical arrangement of four Zingers above another abyss. Afterward, Squitter lands on the ground, and a green Kaboing bounces off a hill in the center; the DK Barrel and Star Barrel are located below the hill. If Squitter continues, he reaches another wall of Zingers who float above a wide gap. If Squitter passes them and travels over the gap, he comes up to a few bananas and the letter O. Two more groups of Zingers also appear. A few more platforms are on the other side of the abyss. Soon, Squitter can find a larger abyss ahead of him. A Kloak stands on the platform on the opposite side of the gap. Two more gaps are ahead, with more platforms on the other sides of them. Kannons stand on the two platforms following the gaps. Another pit can be found after the second Kannon, and it has the letter N in it. Some stair-like structures are located on the other side of it, and Mini Neckies swoop down as Squitter goes down the stairs. The Mini Neckies continue to attack him as he cross a large gap nearby. A platform can be found on the other side of the abyss with a Kannon on it. More Zingers can be found floating in the gap. A hill is on the other side of the gap, and as soon Squitter drops down it, a Kaboing jumps at him from a hill in the background. A second hill can be found, and it has another Kaboing on it. A Kannon also shoots at Squitter as he progresses along this pathway. A small gap follows here, and once it is crossed, Squitter can find a No Animal Sign. If he crosses it, he is transformed back into the Kongs. The End of Level Target can be found nearby, and the Kongs can blast on it from a Barrel Cannon to win either a Banana, a Banana Bunch, a Banana Bunch Coin, or even a DK Coin. Shortly after the letter N, Squitter must pass over a gap with numerous Mini-Neckys. Afterwards, he can find a Kannon firing Kannonballs, and must head left and follow the Kannonball. This is also hinted at by a trail of bananas shaped like a left arrow. The Kannonball eventually hits the wall, breaking open an entrance to the first Bonus Area. 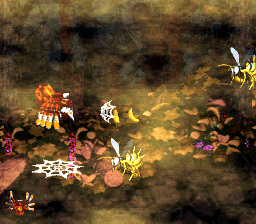 Even though Web Woods is set in the spooky woods, the first Bonus Area takes place in a bramble-themed location. Squitter's objective is to collect the Kremkoin at the other side within 30 seconds. He must cross through a narrow pathway between two brambles and three vertically-aligned Zingers, both of which he must avoid or else he loses. The pathway connecting the start and end point is narrow and is located between the brambles. Squitter is required to use his web platforms to pass through. 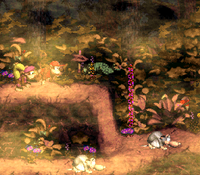 After passing the same Kannon shooting in the direction of the first Bonus Area, Squitter must cross another pit and pass through some red Zingers. After reaching the ground, Squitter must avoid some green Kaboings, and like last time, another nearby Kannon blasts a Kannonball into the wall on the left. This Bonus Area requires Squitter to collect 30 stars, which are arranged to resemble the Rareware logo. Squitter must use his web platforms, as the stars are located above a pit. After collecting them all, the Kremkoin spawns at the Bonus Area exit. At the start of the level, the Kongs must use Team-up to reach an upper area. The letter K is located above a Kutlass in the center of the upper area. After the Star Barrel, Squitter must pass two vertical formations of three Zingers to find the letter O between two single Banans. Squitter must go past a Krook and two Kannons, each of whom are standing on a pillar. The letter N floats in a gap between the third pillar and a set of steps. It is located a bit lower than the peak of the steps, and Squitter must use a web platform to reach the letter. Awarded when the Kongs cross the No Animal Sign at the very end. DK Coin The DK Coin is one of the prizes of the End of Level Target. To obtain it, the Kongs must enter a Barrel Cannon, then blast on the End of Level Target just before the depicted prize changes from a lone Banana to a DK Coin, because it only displays for half a second. In the Game Boy Advance remake, the End of Level Target cycles through the prizes at a slower rate, and the required timing is not as critical. Web Woods is the second and final level to have its DK Coin obtained from this method. 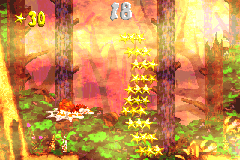 Golden Feather (GBA version) Located against a wall and positioned at the far bottom-right of a red Zinger circling a Banana Coin. Squitter must use web platforms to head down and obtain it. Photograph (GBA version) Acquired by defeating the center Neek from a group of three Neeks located shortly before entering the small room with the Squitter Barrel. The photograph is a picture of Neek, located on the first page of the Scrapbook. Diddy jumps over some Neeks. Dixie in the Squitter Barrel room. Squitter comes out the other side of the Animal Barrel room. Location of the letter O. A Kannon stands on a pillar. The Kongs reach the end of Web Woods. Concept artwork of Web Woods. The duo encounter the first Kutlass. Diddy and Dixie hop above some Neeks. The Krook just before the Star Barrel. A Mini-Necky is about to dive at Squitter. Squitter on a web platform above the letter N.
A group of Zingers above an abyss. The End of Level, showing the DK Coin prize. This page was last edited on April 6, 2019, at 02:37.